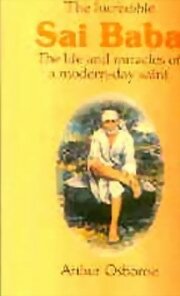 This book is an account of the strange life and amazing powers of Sai Baba, one of the most unusual of India's holy men. Sai Baba never wrote a book, never even read one, and yet learned scholars sat at his feet. He lived in a mosque, and yet his Hindu disciples outnumbered his Muslim ones. He taught them all according to their own faith, yet made them live at peace together. He taught through symbols, and through a wild profusion of well-attested miracles. Although Sai Baba died in 1918, he still has countless devotees throughout India to whom he appears in dreams and visions and whose prayers are answered as miraculously as when he was alive. Arthur Osborne was born in London and educated at Christ Church, Oxford. He was deeply interested in spirituality and spent several years at Ramanshram, the Ashram of the Sage Ramana Maharshi at Tiruvannamalai in South India. His other books are Ramana Arunchala and Ramana Maharshi and The Path of self-knowledge.